Q: What is the difference between a Russian tragedy and a Russian comedy? A: In a Russian tragedy, everybody dies. In a Russian comedy, everybody dies – but they die happy. Well, Tchaikovsky’s opera, based on Alexander Pushkin’s novel-poem doesn’t quite fit in that definition of a Russian tragedy in that only one person dies – but he dies unhappy; and the other two principal characters end the opera destined to live unhappily ever after. With all that doom and gloom, you might think we, the audience, would be depressed at the end of the opera. Not so. We were over-awed by the perfection of the performance. Anna Netrebko is in a class by herself. She has an incomparable soprano voice in all registers and at all volumes. She is beautiful to look at, even in repose (which she seldom is). She doesn’t act a role, she is the character – and this is particularly true with Tatiana. And she is completely transparent. Every muscle of her face, every position of her body, every note of her voice tell you exactly what she is thinking and feeling. It almost seems indecent to expose a teen-age girl’s innermost being to a worldwide audience! During one of the intermissions Deborah Voight conducted an informative interview with Anna. She asked her how she made the transfer from the naïve teenager of Act I to the mature sophisticated wife of Act III. “Act I was easy. I just remembered my youth. I grew up as a teenage girl in Moscow. We girls all read Pushkin and adored Tatiana, and we each imagined having an impossibly ideal lover. That was many years ago. Perhaps now the real me is more like the Tatiana of Act III.” Later in the interview Anna showed that maturity had not caused her to lose any of her natural exuberance. When Deborah asked a routine question about how had the director helped her interpret her role, instead of the usual platitudes, she stated simply, “I learned nothing from her. “ Meaning, I am sure, no disrespect, but she had just finished telling us how the role had precisely fit her own growing up. The interview with Mariusz Kwiecian (Eugene Onegin) was also informative. Onegin is a signature role for him; he has sung the part in dozens of previous productions all over the world. 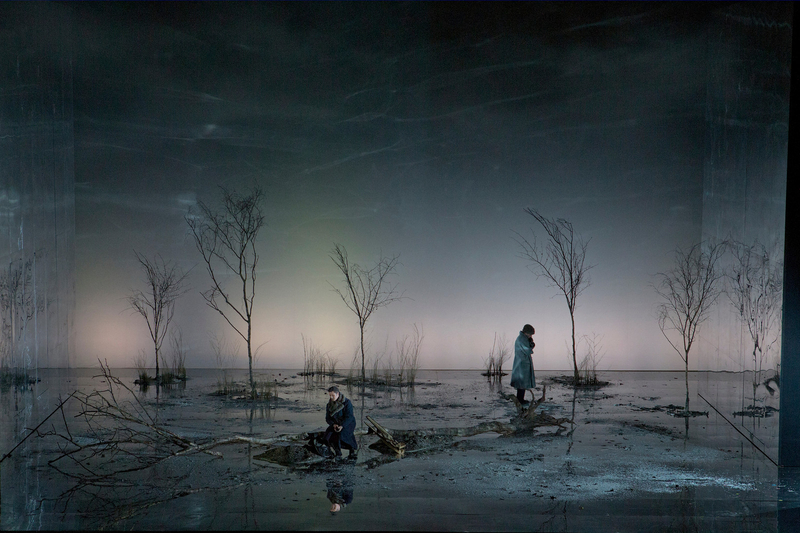 When Deborah asked Mariusz if there was anything different about his character in this production, he replied that he visualized Onegin in Act I as a kinder, gentler person than he had previously. 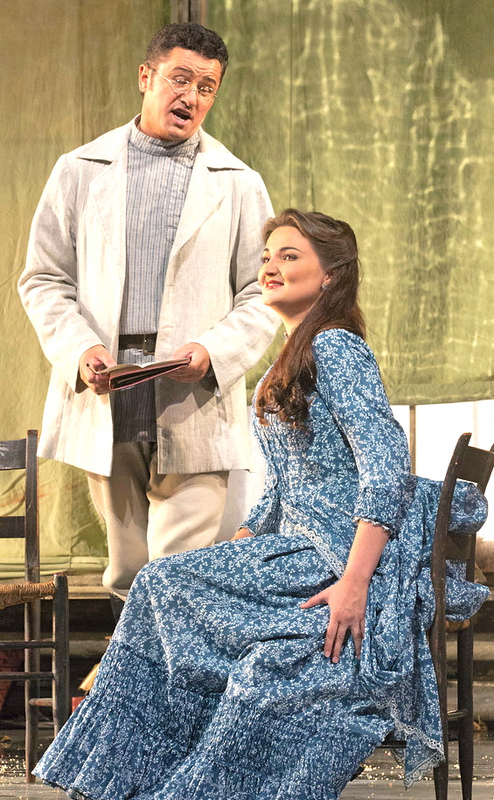 When Onegin tells Tatiana that “I am not the marrying kind, but if I were you’d be #1 on my list,” he really means it. Indeed, the interview merely confirmed what was obvious from the fervor with which he kissed her good bye at the end of the scene. No avuncular peck on the forehead for this Onegin. 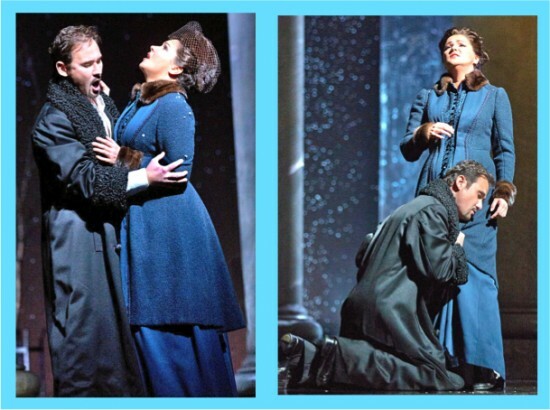 As a singer and as an actor, Mariusz Kwiecian was a worthy foil for Anna Netrebko. As the opera progressed, his actions and his voice both clearly showed the decline of his character from the high point of his difficult renunciation of Act I. His treatment of his friend Lenski in Act II is shameful and culminates in the killing of his friend in a totally unnecessary duel. Mariusz’s remorse is genuine and heartfelt – but comes too late to do any good. Then when Onegin and Tatiana meet again in Act III, the passion is there on both sides – but is handled oh, so, differently. Mariusz makes no effort to control it, but literally begs Anna to dishonor herself and her loving husband by running away with him. Anna does not dignify this base proposal with a verbal reply. She gazes sadly at her would-be lover for a long moment and walks slowly off stage – her dignity and honor intact to the very end. Mariusz gazes slowly at her, the lights fade, and the final curtain descends. Even as the tumultuous applause begins, my mind recalls the opening scene of Act I: Tatiana’s mother, Mme Larina (Elena Zaremba) is reminiscing with her nurse Filippyevna (Larissa Diadkova), about the days when she was a teenage girl happily in love with a dashing young man. Before she knew what was happening, her parents had married her off to an older man of their choice. She was unhappy, but had no thought of resisting her fate. Now, as a widow with teenagers of her own, she muses, “Instead of Happiness, Heaven gave me Habit.” With this subtle reference back to the beginning, Tchaikovsky has brought closure to this complex drama of very real Russian people. In my mad gallop from opening to closing curtain, I seem to have given only the briefest of mention to the third superstar of Eugene Onegin. I was concentrating on character development, and the character of Lenski (Piotr Beczala) is far less complex than that of the other two. He is sober and serious – a country boy and a poet – and he is deeply in love with Olga (Oksana Volkova), Tatiana’s 15-year old sister. His only flaw – and it’s a doozy – is that he is insanely jealous. He has no cause to be. Olga loves Lenski and definitely wants to marry him. But not yet. She’s still a beautiful fun-loving 15-year old who’s delighted to engage in a bit of flirtation with a handsome stranger but will scurry back to Lenski’s arms if it threatens to go too far. The young mezzo Oksana Volkova captures her essence perfectly. Her harmony-singing with her older sister earlier in the scene is a delight. I hope I’ll get to see and hear more of this young lady. P. S. This year, unfortunately, MetHD has scheduled its U. S. Encores on the Wednesday immediately after the Live in HD showing, so it’s probably too late for you to see it. 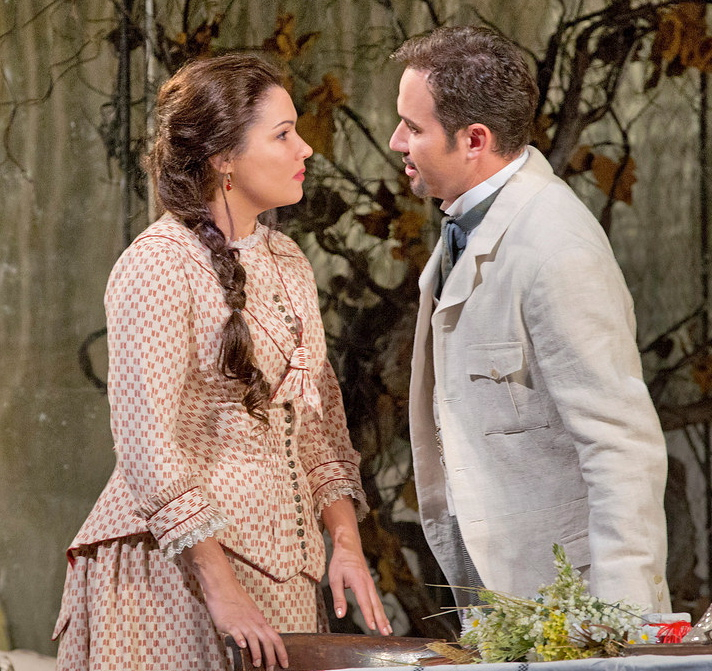 If you can get to New York, there are several more performances between now and December 18, but Saturday, October 19 is your last chance to see Anna Netrebko. See the complete schedule. This review by Philip G Hodge appeared in sanfranciscosplash.com on October 9, 2013. This entry was posted in Opera Review and tagged Eugene Onegin, MetHD, Tchaikovsky. Bookmark the permalink.